I think I used photopaper but the watermark didn't show up as well as the original. but like I said " no one will know the difference at a car show or hanging on your wall ". When I get a chance I will take a look on the back of the copy. "Hell Yes your Fast! You were hauling a$$ when i passed you!" im pretty sure i registered last month my name still isnt on the last? I gotta get on this list. I want a certificate. I'll grab my vin later. 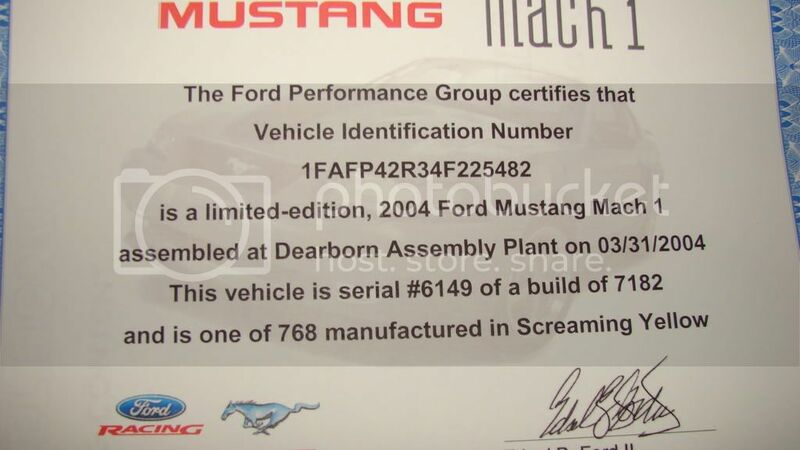 I got this info in my cert package also, but for the 2003. Just sent in registration. Will check back in several weeks. Thanks and Happy New Year! does anyone know if the discount applies online also or is it only on the phone? Wahhooo, the owners list is updated!! Thank you to the powers that be!! Last edited by MustangJoe; 09-08-2011 at 09:42 AM.